Android: Login to google and go to https://www.google.com/android/devicemanager. Make sure your phone is showing proper location prior to launch. This is extra insurance to be able to locate your rocket after landing. Confirm it is properly setup before continuing. In the application, go into Settings by tapping Settings 1, then Settings 2 followed by Settings 3. By having settings require three taps to enter, it is less likely to be entered while configuring your rocket to launch. Scroll down until you see the above information. Enter your email, password, and a unique lookup number for your phone. If you have only one phone, there is no need to set the Lookup Number. Click Login to verify you have entered your information correctly. Insure Record Data Online is enabled. Tap Done at the top of the page. Then exit the application by pressing the Home button and re-enter the application. 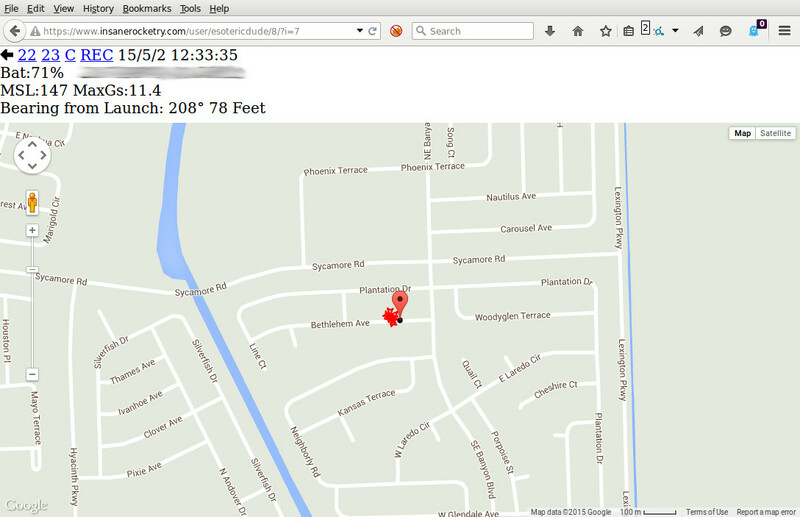 You now have GPS data being recorded to your account online! From another phone or computer, login to https://www.insanerocketry.com. Click the Data button to see a list of Lookup Numbers that you have used(from settings). Click the one being used for this test. If you do not see the Data button, recheck your Settings on the application. Map information is then displayed. This will include the rocket's flight path and final GPS location. You should see the time updating every 5 seconds if the application is active. Note: You should always test to make sure you are getting live updates every 5 seconds before launching! Keep a close eye on how much battery life is left in your phone. It is reported on the map screen above with the caption Bat:. RECord from map: To conserve your battery and reduce overheating, the camera is not turned on until the time of launch. It takes up to a second (this varies depending on make and model of phone) to initialize which means you will miss the first second of video of your rocket lifting off the pad. To overcome this, press the REC button on the above screen 10 seconds prior to launch. This will start video recording from the point the REC link is hit. It will continue to record for 30 seconds or until the rocket launches. 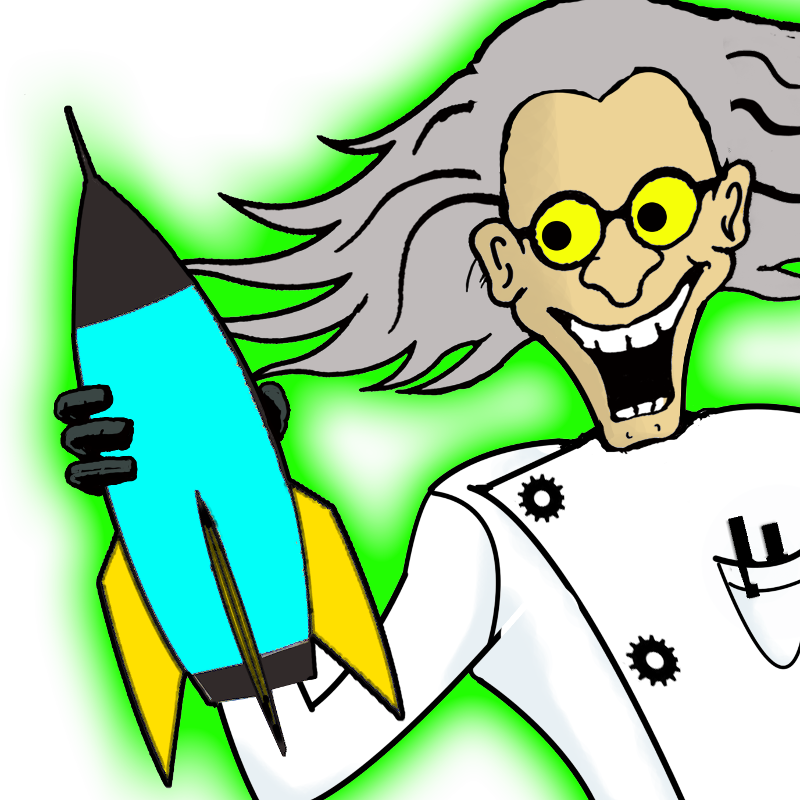 Tap the REC button every 10 seconds until launch occurs. You will be able to tell if video is recording by a single * appearing next to the REC link. 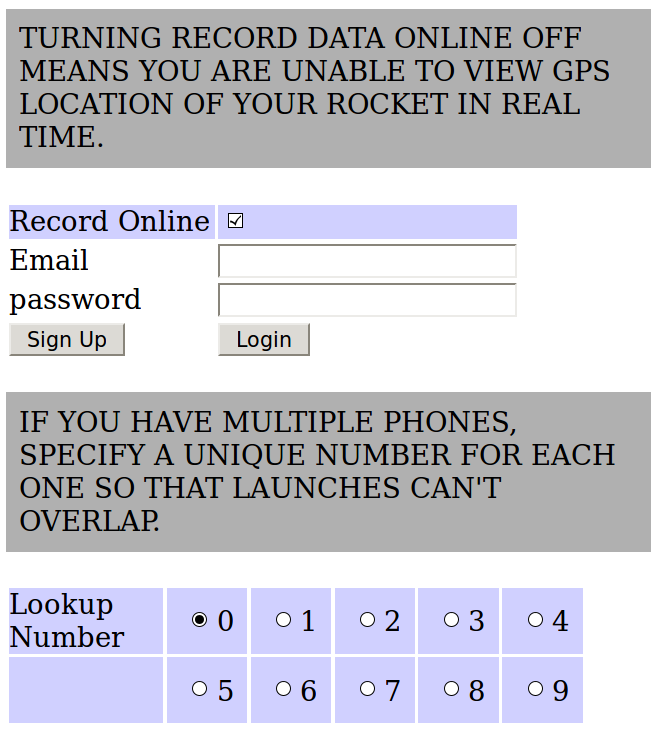 For your phone on the ground(recovery phone): If the phone has location services, this screen will include the bearing and distance from your location to find the rocket. If you only have one phone, borrow a friends phone at the field for recovery. Simply walk on direction indicated to recover your rocket! If the phone you are using doesn't have location services, you will get bearing and distance from the point the application was started at the field. Testing: Hold the phone vertical, portrait (you can configure this) wait for it to speak that it is ready and then shake the phone hard to simulate a launch. You should see record: ON in the main screen. Once record turns back off, click the Data button and you will see two files prefixed with the word bogus. That means that the application figured out this was not an actual launch, but simply a knock of the phone. You can view both the video and the data file by tapping them. Video Init Time: The amount of time it takes your phone hardware to start video recording. Shake your phone to test. If this time is greater than 1.5 seconds, make sure to use the REC from another phone just prior to launch. Warning: Insure your phone has plenty of storage capacity to store launch video and data prior to each launch. Unexpected results will occur if storage runs out during a launch.